As hard as it is to believe, this season is our 20th at the Carrboro Farmers’ Market! This week twenty Junes ago, June 7th 1986, we made our first feeble attempt at selling our vegetables, flowers, and berries at market. We started the farm as a pick-your-own blackberry and raspberry farm planting the first crops in 1982. Because they were perennials we didn’t open for business until 1984 and quickly realized that the pick-your-own business wasn’t going to pay the bills. We began to look to additional markets for our berries. In the winter of 1985 my brother Jon moved here to join us in the farming venture and we turned over the last piece of ground we had that wasn’t in berries. Jon is a natural grower and he and Betsy had the little quarter acre patch overflowing with vegetables. Our neighbor George Graves (some of you may remember him as a vendor at the market) kept saying “you really need to bring your berries down to the Carrboro Market” every time we went to check the market out it was pitiful. No customers and none of the vendors had anything to sell. Turns out that 9:00 was too late to get there, it was all over but the cleanup by then. Our first day it took two trucks to get everything to market, not that we had that much to sell, just that we were that disorganized! One truck for the little bit of produce we had and one for all the display materials- saw horses to hold up the door we used as a table, five gallon buckets filled with concrete and poles to hold up a tarp, etc. We had zucchinis the size of gun ships, summer squash, a few flowers and not much else. We made $17. It didn’t look like the market was going to pay the bills either but we were excited! The customers were great, interested and encouraging. The other vendors were helpful, we were so inept we certainly couldn’t be competition! Jon left the next winter and the blackberries are long gone but we have now made the market the center of our business. As exhausting as it can be we still are excited about going to market and seeing all of the customers who are still interested, encouraging and great! The turkeys finally made it out to the field in a wild move. Last Thursday as the berry picking finished up I decided to use all of those hands to help move them from the brooder to their first stop in the fields. It had been raining and we waited until it stopped, we thought. As we were chasing them around it started to rain again and by the time we had finished it was a down pour. The poor birds were shell shocked both by being caught and handled but were soaking wet too. We rushed their portable shelter over and got them all loaded with fresh food and water. 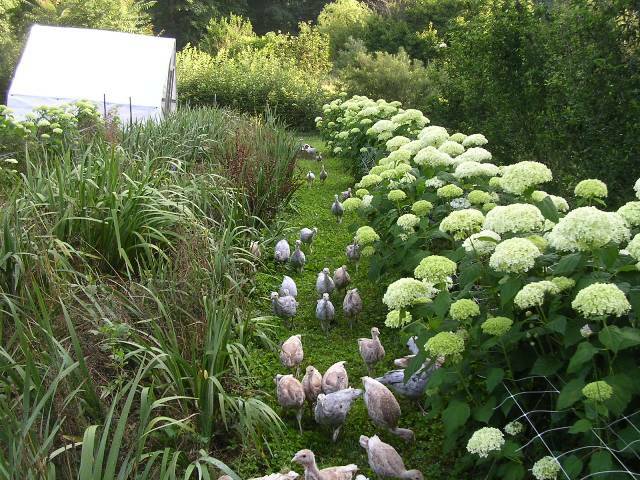 In an hour they were all dry and happy and so I let them out to run in the hydrangeas and viburnums. They are now trained professionals, ranging the area for bugs and grasses by day and each evening as I go to put them up they are already loaded into the shelter, on the roosts, ready for a nights sleep.